While attending truck driver training school at Georgia Driving Academy, you will meet with several trucking companies looking to hire new drivers. Whether you are interested in local, regional, or national (over-the-road – OTR) driving, you will want to make sure you know what each carrier has to offer before you sign a contract. There are a variety of different carriers out there looking to hire drivers. Some carriers specialize in local jobs while others work regionally and some work on a national level. Each carrier will also provide different working hours, job locations, benefits, and wages. When speaking to recruiters from these different carriers, you will want to know what questions you need to ask them to ensure that the job they are hiring for is the right fit for you. So, What Do I Ask These Carriers? It is best to come prepared with a list of questions that you want to ask the trucking recruiter. This discussion is your prime opportunity to gather information before you decide who you will choose to work. There are many different things that you will want to know about before committing to work for that specific carrier. Writing your questions down will help you remember them and ensure you ask them all. Bringing a pen to take notes will help you remember the information if you wish to compare companies later. What is the company’s home-time policy? How much time off can I expect to get through the company’s home-time policy? What is your policy for needing extra time off (i.e., medical needs, injuries outside of work, illness, family emergencies, etc.)? What kind of paid vacation do you offer me the top start? How much vacation time can I earn staying with this carrier and how long does it take to receive it? Are there restrictions on when I may use my vacation (i.e. not around holidays, only so many days off in a row, etc.)? Dp vacation days expire annually or carry over into the next year? How much vacation can I accumulate at once before I must use it? Which routes do your drivers drive most often? How many driving miles can I expect to long? What kind of equipment do I need to be comfortable working with on a regular basis? Will my truck get the air-ride suspension? Will my truck have a sleep-in area? How many loads can I expect to haul each week or month? What do you pay drivers for each job position (i.e., local drivers, regional drivers, OTR drivers, etc.)? What kind of raises can I expect to receive over time? Does the cost of living in my area affect how much you pay me? What are the potentials for promotions in the future if I take this job? What do my promotion potentials pay once I earn them? Do you provide healthcare coverage for driver’s families? What plans can I choose from when I am choosing my healthcare? Do you offer retirement benefits such as a 401k? If you offer retirement benefits, do you offer employee matches on certain contributions on an annual basis? What are your retirement benefit matches on employee contributions to their retirements? What are your retirement maximum benefit contributions to my retirement on an annual basis? How do you earn bonuses and what are criteria for qualifying for them? When you do provide bonus pay and when can I expect to receive any that I earned? Is there a limit on how many bonuses one driver can earn and the dollar value that it can add up to on an annual basis? Do you offer me driver sign-on bonuses? Who is responsible for loading or unloading a truck if you don’t hire lumpers? Do drivers ever have to load or unload their trucks? If I miss delivery deadlines what are the consequences to me as an employee? What about missing deadlines for circumstances beyond my control (i.e., truck breakdowns, bad weather, traffic, accidents, etc.)? Will I get a dedicated driver manager? What are the policies you have on how many hours I must rest versus how many hours I can drive? Are there any other company policies or rules that I need to be aware that exist? 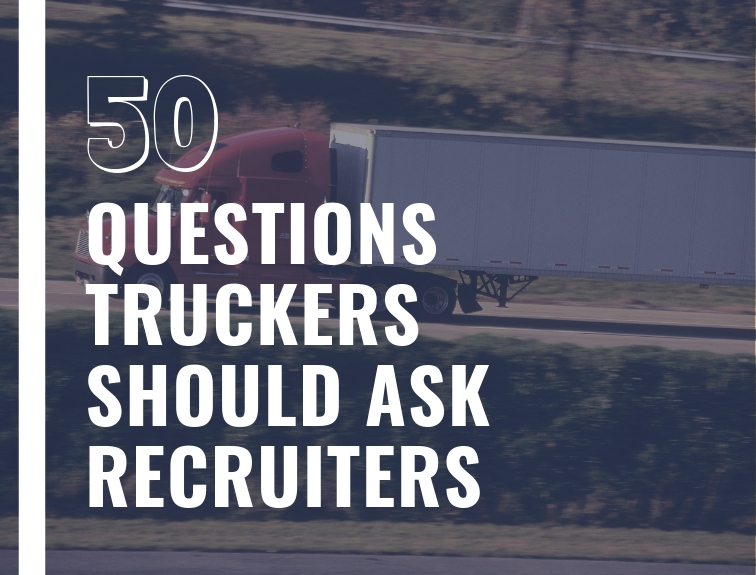 These are just a few of the questions that you may want to think about when talking with trucking recruiters. Understanding all of this information up front will help you make a better decision. If you’re looking to enter the trucking industry, contact Georgia Driving Academy to get started with your CDL training.